Having a basic training of trial advocacy for some years, Mr. Meer prepared himself for diverse legal fields by opting three different areas in his Masters Program at McGill University, Canada where he also studied in depth the corporate governance systems of USA, Japan and Germany while working on his thesis project. Mr. Meer got an opportunity to fortify his concepts by hands on experience in another leading law firm of Pakistan. Since then, he has become a very active member of M&H and takes care of a whole range of legal areas. 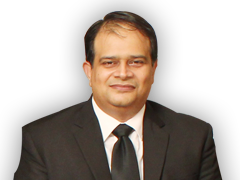 Mr. Meer is experienced in conducting due diligence/legal audits, structuring transactions and drafting and vetting agreements, rendering opinions on corporate financing and on any legal issues including but not limited to intellectual property law, employment law, immigration law etc. Mr. Meer has drafted / vetted numerous high profile agreements. He also conducts court cases in High Courts. Acted as member of team who conducted due diligence for bidders during privatization of Habib Bank Limited. Acted as leader of team who conducted due diligence for successful bidder during privatization of Allied Bank Limited. Structured the successful acquisition assignment for a leading food company. Advised a foreign company in closure of one of its offices in Pakistan. Reviewed and vetted the Franchise Agreement between a multinational company and a UAE based group. Successfully completed a project of Decentralization Support Program funded by Asian Development Bank involving review, compilation and sorting of scattered local government laws of Province of Punjab. Office: 103-A Bridge Colony Lahore Cantt., Lahore, Pakistan.